They were two of Australia’s most notorious fugitives, racking up a string of crimes that ranged from murder to vandalising property. Now never-before-seen footage has emerged of the moment father Gino and son Mark Stocco fired a high-powered rifle at a highway cop during one of their escapes. 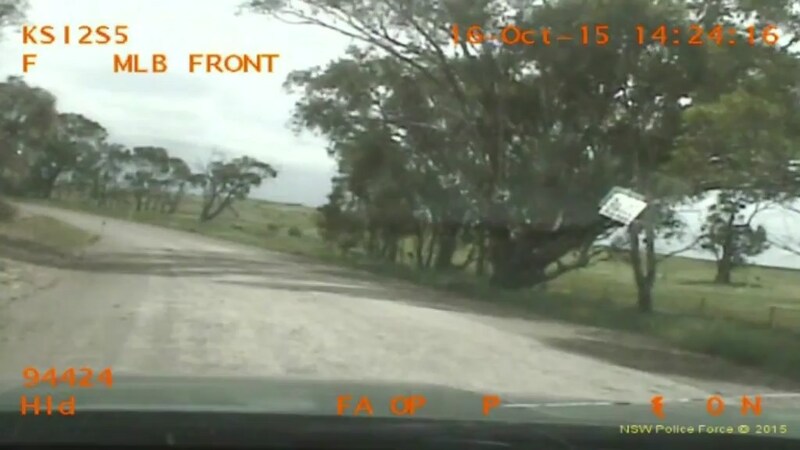 The dashcam footage was captured near Wagga Wagga, in southern New South Wales, back on October 16, 2015 after the pair had been cornered by officers. A highway patrol officer can be seen pursuing the pair at speeds of more than 100km/h down a dirt road before there is the quiet sound of metal being hit. The officer can then be seen slamming his car into reverse before backing several hundred metres up the road, and turning the vehicle around while a helicopter continues the chase. One of the bullets went straight through the car’s radiator, through the engine, severed the brake lines and then embedded itself in the front passenger seat. Fortunately the officer was the only person riding in the vehicle at the time. The Stoccos would shoot at officers once more during the same pursuit, this time at highway patrol officer Matthew Shaw. Speaking about his own ordeal outside court, Shaw said: ‘I though about self-preservation, what’s going on, why are they shooting? ‘And then getting back to the job that I’m supposed to do, and that’s protecting the people and apprehending people when they’re doing the wrong thing. The video was played in New South Wales Supreme Court on Friday as the pair prepare to be sentenced for their eight-year crime spree. Gino and Mark Stocco are now facing lengthy jail terms after they both pleaded guilty to the murder of Rosario Cimone , 68, shooting a rifle at officers, and property damage stretching into tens of thousands of dollars.